Disclaimer: I cannot be held responsible for whatever damage or loss, physical or mental, related to attempting to repeat something described in this post. It is provided for educational purposes only. Never disassemble electronic devices, especially batteries and battery packs, especially lithium ones, unless you have necessary proficiency and qualification in electronics. 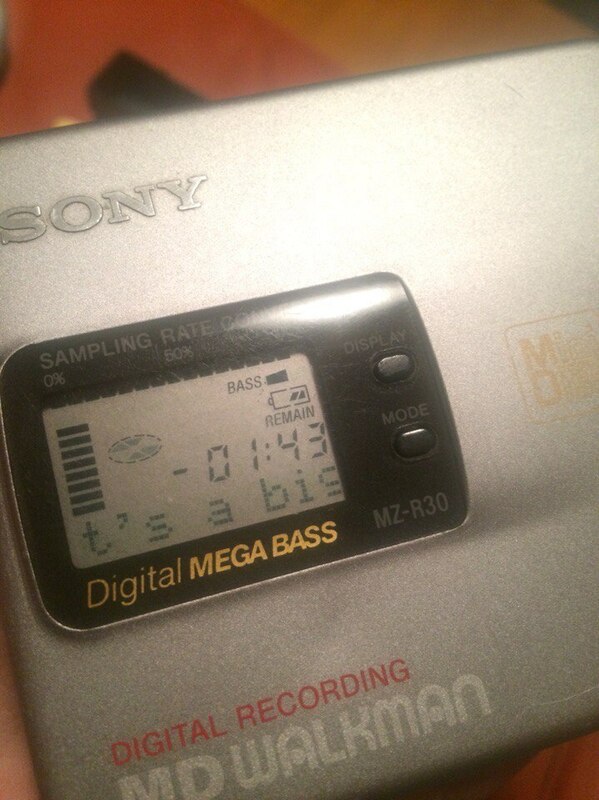 Recently I’ve acquired a Sony MZ-R30 Minidisc player. It’s a kinda fun format, but the fact that I had to use a 2AA case in order to enjoy my music was quite disappointing. 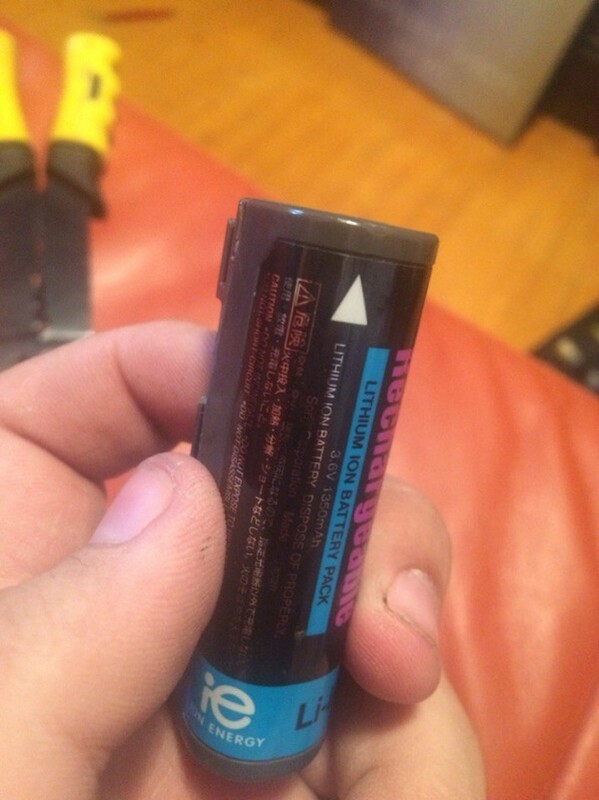 After fiddling around with the dead LIP-12H that came with it, I came to a conclusion that it’s definitely a somehow packaged 18650 cell. After carefully prying it apart with a hard plastic spudger and an X-acto knife, here’s what I saw inside. 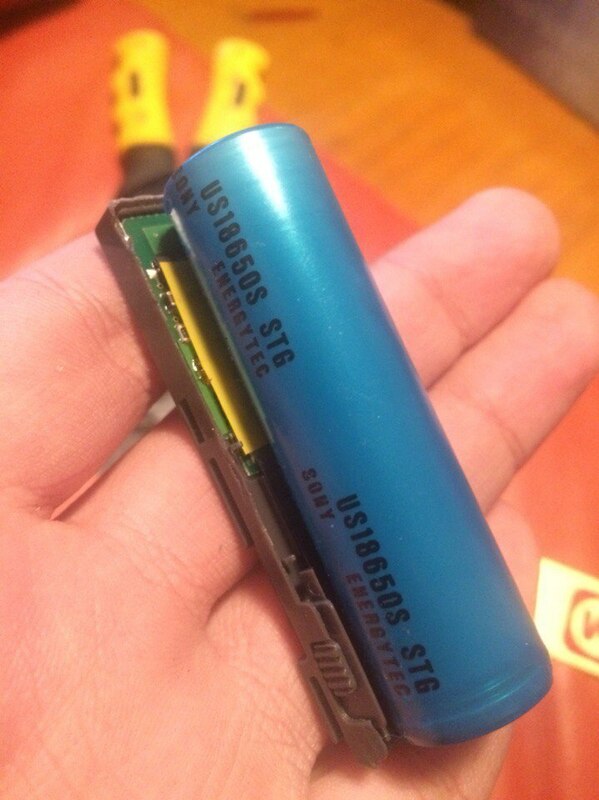 Sure thing, it’s a 18650 with a small protection/driver module. 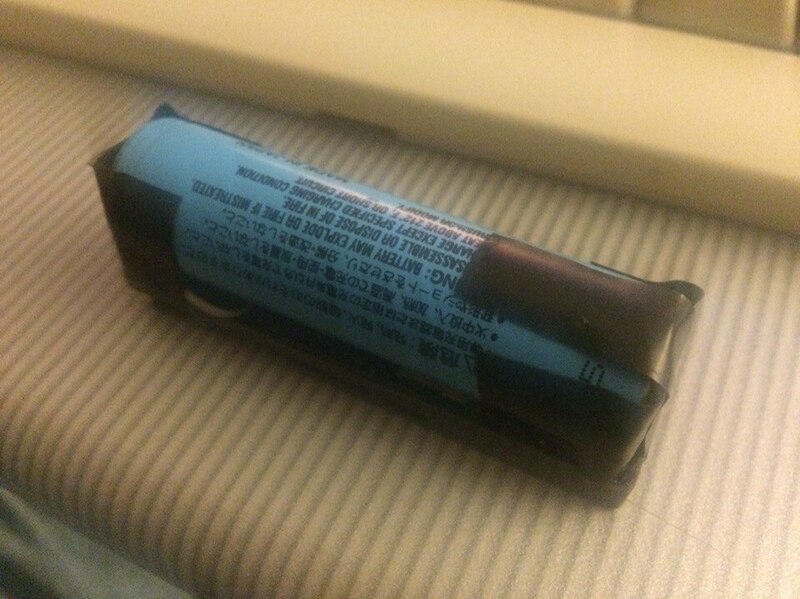 The battery turned out to be a Sony Energytec US18650S STG ICR Li-Ion cell. The voltage measured around 0.86V, so it’s definitely going to be discharged and then handed in at a battery recycling point, along with some others undercharged ones. To remove the battery, I cut the long positive zinc terminal behind the cell by bending it a bit outward, and carefully cutting the zinc stripe in half. Then I pulled hard on the cell and it detached from the bottom negative cell tab which was soldered directly on the protection circuit. Afterwards, pulling the remaining positive tab got it free. Don’t throw them away just yet, instead make them nice and flat (and cut off the “tail” of the positive one”). For easier working, I also cut the remainder of the positive tab’s tail that was still attached to the protection board so that it would just form a soldering pad on the board itself, instead of completely desoldering it. Now I had to find a replacement cell. I’ve done a big old laptop battery teardown this summer, and even though 2 of the salvaged ones were already undervolted, and 4 more were rendered useless by lending a 18650 powerbank to a classmate who let them down to 2.05, I couldn’t get myself to buying new cells, and that’s why I kept the tabs. It would be great if I had a Li-Ion cell welding machine, but so far, I just went on and soldered a piece of wire from an ATA (IDE) cable onto the remaining square pad, and the other end onto the remaining zinc tail on the positive input of the protection circuit. 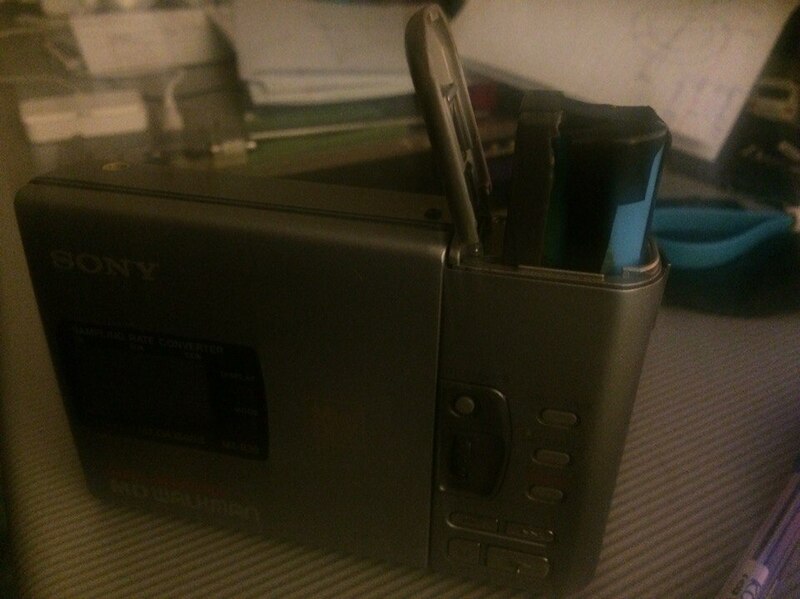 Then I picked a replacement cell, my choice was a Panasonic CGR18650C, because they seemed to be somewhat good looking and are what I had at hand (I have plenty of other Sony ones, but just 2 of these after the other 4 ones died, which doesn’t even make them a viable powerbank set :P). Afterwards I used some electrical tape to secure the pads to the cell, because as you should know by now, one should never ever solder directly to a Li-Ion cell, and I don’t have a cell welding tool. I made sure it’s as tight as possible so that the playback would not interrupt, and then secure the cell to the original casing. Sliding it in also became a bit harder than it was originally, because of the changed size, plus one has to observe the wire so that it won’t get stuck in the way somewhere along the slide and short out onto the case (should’ve used more electrical tape, yeah). It fits quite nicely, but what does the player itself think? Load an MD, and bam! 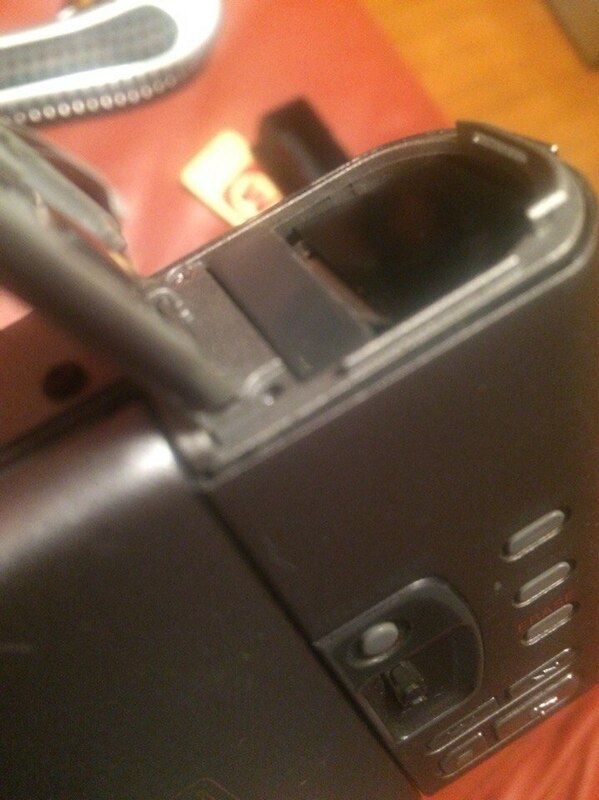 Charging the battery inside the player right now with a Sony PSP 1.5A charger and the battery doesn’t seem to even get any hot, so I’d call it a success. Not the best way it could be done, but clearly a success.